Beautifully engraved certificate from the Missouri, Kansas and Texas Railway Company issued in 1886. This historic document was printed by the American Banknote Company and has an ornate border around it with vignettes of cattle and cherubs. This item is hand signed by the Company’s officers and is over 119 years old. The Missouri-Kansas-Texas Railroad Company (M-K-T or Katy), the first railroad to enter Texas from the north, began its corporate existence in 1865, when its earliest predecessor, the Union Pacific Railway Company, Southern Branch, was chartered by the State of Kansas to build from Fort Riley, Kansas, to the state's southern boundary. Levi P. Morton, Levi Parsons, August Belmont, J. Pierpont Morgan, George Denison, and John D. Rockefeller became interested in the road after the federal government announced that right-of-way through Indian Territory and a liberal bonus of land would be given to the railroad that first reached the Territory's northern border. Texas was also interested in the project. In 1866 the first legislature after the Civil Warqv passed a resolution recommending that Congress adopt means to insure the building of the Union Pacific, Southern Branch, through the state, as at that time none of Texas's railroads connected to those in other states. In 1870 the railway's name was changed to the Missouri, Kansas, and Texas Railway Company, a change which defined both the company's strategic intent and its service area. The newly named railroad was intended to funnel business from Missouri, Kansas, and the north and east to a new rail route across Indian Territory to and through Texas. The Katy, touted in advertisements as the Gateway to Texas, breached the Texas frontier near the site of present Denison, where the first regular train arrived on Christmas Day, 1872. However, no land in Indian Territory except the right-of-way was given the road; the courts held that Congress had exceeded its authority in granting to the railroads land that belonged to the Indians. Its promoters hoped to drive the road on to the Rio Grande and even into Mexico. The Katy did eventually expand operations in Texas to serve Dallas, Fort Worth, Waco, San Antonio, Houston, Galveston, and Wichita Falls. The company had no charter to build in Texas, but the one granted by Kansas was approved by the Texas legislature on August 2, 1870. In a series of rather unusual concessions by the Texas legislature to the railroad, the road was not required to take out a Texas charter but was given the same rights as if it were incorporated in Texas. Similarly, although the Constitution of 1869qv prohibited land grants to railroads, the legislature did provide that the incoming road be exempted from taxation for two years if it built fifty miles in Texas within three years and reached the Colorado River near Austin in six years. The Missouri, Kansas, and Texas Railway Company did not become officially incorporated in Texas until 1891; until then it operated in the state under its own name or through various subsidiary companies. Ultimately the company did not receive any state land nor did it earn exemption from taxation as it did not build beyond Denison under its own charter until after 1882. In 1880 the Katy was acquired by Jay Gould,qv who leased the railroad to his Missouri Pacific Railway Company in December of that year. However, during the Gould era the Missouri, Kansas and Texas continued to expand in Texas, reached Dallas, Fort Worth, and Waco, and made significant progress on a line to Houston and San Antonio. The railroad acquired several short lines, such as the Denison and Southeastern Railway Company and the Denison and Pacific Railway; upon their acquirement they were operated as the Missouri, Kansas and Texas Extension Railway Company, until they were merged with the parent company in November 1881. In that year Gould also transferred the Dallas and Wichita Railway Company to the Katy. By 1882 the Katy had 638 miles of trackage in Texas. In 1890 the Katy owned 849 miles in Texas in addition to the Gould controlled International and Great Northern, which it leased in 1881. However, in that year Attorney General James S. Hoggqv won his suit to cancel this lease as well as the Katy's right to operate in Texas as a foreign corporation. This resulted in the chartering of the Missouri, Kansas and Texas Railway Company of Texas on October 28, 1891, to acquire all of the parent company's Texas properties with the exception of the International and Great Northern and the East Line and Red River Railroad Company. The Texas legislature approved the consolidation. In 1895 the Missouri, Kansas, and Texas railroad reported passenger earnings of $1,200,000 and freight earnings of $3,000,000 and owned 133 locomotives and 163 cars. In 1896 two locomotives of the Missouri, Kansas and Texas Railroad took part in a spectacular publicity stunt, the Crash at Crush.qv In 1899 the legislature authorized the Katy to take over the old East Line and Red River, which was rechartered as the Sherman, Shreveport and Southern Railway Company. Included in the act was a provision that the line abide by the rates, rules, and regulations of the Railroad Commissionqv until set aside by the courts. This provision has prevented the Katy from joining other Texas lines in attacks on the commission. Over the next several years the Katy continued its expansion in Texas; by January 1, 1904, the Missouri, Kansas and Texas Railway Company of Texas owned and operated 1,119.33 miles of rail in Texas. On May 1, 1914, the Missouri, Kansas and Texas Railway Company of Texas leased seven companies, including the 309-mile Texas Central Railroad Company. These leased lines gave the company over 1,600 miles of operated track in Texas. In 1915 all of the Katy properties in and out of Texas went into receivership. C. E. Schaff, who had been president since 1912, was receiver. On April 1, 1923, the company was reorganized as Missouri-Kansas-Texas Railroad Company of Texas. During the reorganization some of the Katy's Texas lines were sold and certain leased lines were excluded as they did not strengthen the new company. After the cuts the Katy had 1,234.30 of owned and leased main line miles in Texas. In 1931 it reported passenger earnings of $1,722,000, freight earnings of $8,085,000 and other earnings of $1,542,000, and owned eighty-two locomotives and 1,000 cars. Though the road intermittently experienced financial difficulties, it not only opened a huge territory but contributed to the general well being of its service area by supplying economical and reliable freight and passenger service. Wheat flowed regularly from Katy lines in Oklahoma to Fort Worth, Houston, and Galveston, and oil rolled out of on-line patches in train-load lots. Passengers luxuriated aboard the Texas Special, the Bluebonnet, and the Katy Flyer. After 1900 the Katy was intermittently prosperous. Revenues reached an all-time high during World War II,qv and the railroad continued to do well until the early 1950s, when factors including debts, equipment problems, and a severe drought in its Texas service area combined to drive the Katy towards near bankruptcy. Still, until recent times the Katy was ranked as an important regional carrier, but huge systems such as the Burlington Northern and the Union Pacific, after the merger of the Missouri Pacific and the Western Pacific, relegated the Katy, by comparison, into the status of a short line. Starting in the 1950s numerous cost-cutting measures were implemented. In 1954 and 1956 the Katy's six superintendent divisions were consolidated into two, one at Parsons, Kansas, and the other at Waco, Texas. 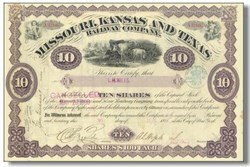 On July 1, 1960, the Missouri-Kansas-Texas Railroad Company of Texas was consolidated with the Missouri-Kansas-Texas Railroad Company in order to cut costly duplication in the companies' two separate accounting and legal departments. Despite such pruning measures, the Katy's fortunes continued to decline. During his 1965-70 tenure as president of the Missouri-Kansas-Texas, John Walker Barriger III, a well-known advocate of railroad survival through mergers, tried unsuccessfully to find the Katy a merger partner. In 1967 it reported a net loss of over $10,000,000. Though in 1976 the Katy obtained a $19 million government guaranteed loan to repair deteriorating track ties, the railroad's fortunes otherwise continued to decline. In 1988 the Interstate Commerce Commission gave Union Pacific and its subsidiary, the Missouri Pacific Railroad Company, permission to buy the Katy. The ICC cited the Katy's ongoing financial problems as a major factor contributing to their permission for the sale and also noted that the sale would be in the public interest because it would improve rail efficiency. On December 1, 1989, the two companies merged, and the Missouri-Kansas-Texas was no more. The Missouri Pacific and Katy already had joint operations from Durand, Oklahoma, to San Marcos. Only a few miles of the Katy were abandoned as a result of the merger, and some of that trackage has been spun off to short line operators. Two subsidiaries of RailTex, the Dallas, Garland and Northeastern Railroad and the Texas Northeastern Railroad operate three segments of former Katy track in the Dallas and Denison area.